So, make a date in your diary for 2019 and meet the team at one of the great indoors or outdoors shows this year. As usual we will be attending the outdoor events at Peterborough, Stoneleigh and Lincoln as well as the two NEC shows in February and October. 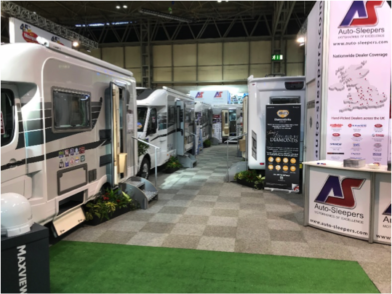 For us, every day is a little like being at motorhome show here; The range of Auto-Sleepers is usually on display permanently in our 27,000 square feet showroom in Derby. 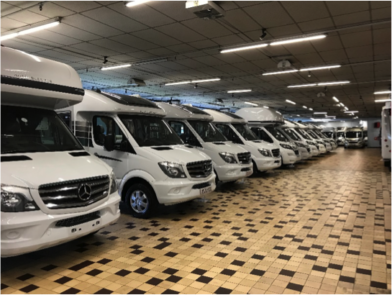 We try to keep every 2019 model Auto Sleeper motorhome on display in our comfortable, heated, indoors showroom so, no nasty weather to cope with here, just an easy way for looking at layouts, designs and models. Our popular social media is always available and updated so why not keep in touch when we’re attending a motorhome show. This may even be your 1st time at a motorhome show. So, are you just here to test the water so to speak or talk more seriously about a change? However you feel, we want your visit to be a memorable day out for you and the family and If we are able to make your day with a special deal, so much the better. Motorhome special offers are usually available at these shows so, with great deals available on the day too, come and enjoy all of the fun of a show! See details of our offers on our special offers page. The large motorhome show at the NEC exhibition centre in Birmingham happens twice a year, in February and October. We will be there, as always for each event working from the Auto-Sleepers stand and available to answer all of your questions and offer great, show-only deals on new Auto-Sleepers. Come along and meet us at the NEC motorhome show. Enjoy a coffee and discover how we can help with your new Auto-Sleeper purchase. The Derby team love the NEC shows and really enjoy meeting customers old and new and find your feedback so useful too. Meeting motorhome owners is invaluable to us and meeting our old customers is very important and gives us a chance to catch up. Another great benefit of attending motorhome shows is helping first time buyers overcome the nerves and assisting them in choosing the right motorhome or campervan for them. So, we extend an open invitation, to come and talk to us about motorhomes and campervans on the Auto-Sleepers stand at the NEC this year. 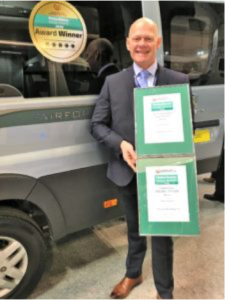 The Award – winning Auto-Sleepers motorhomes are rightly regarded as the leading UK motorhome manufacturer and recently won the best motorhome manufacturer award as voted for by motorhome owners. Motorhome shows have become an annual pilgrimage for a lot of owners and buyers and yes, a pilgrimage for us too. Major awards tend to handed out at these events too so, it’s really handy to be around and see who’s won which award; needless to say, Auto-Sleepers are always in the mix so to speak! For that weekend away with great entertainment. Or that single day out to see your favourite motorhome, come and visit us at one of this year’s events. We always have a great display of new and late-model used Auto-Sleepers too look at and buy. We are happy to discuss part exchange prices and the details of your existing motorhome. Meet up with the team on the Derby Motorhomes or Auto-Sleepers stand and ask all those questions you’ve always wanted to! Anything you need to know about Auto-Sleeper motorhomes should be answered by our team. We exhibited at a number of motorhome shows in 2018 and will be there, at the same events again in this year too. Last year we enjoyed catching up with everyone again at the NEC – twice, Peterborough, Stoneleigh and Lincoln and we’re looking forward to the same again in 2019. These shows are a great meeting place. Ideal for our many customers to say hello again, relax with tea or coffee and a piece of cake or biscuits. For us, the show season starts at the NEC in February 2019, we next attend the Peterborough show in April, followed by Stoneleigh in June, Lincoln in September and finally the NEC again in October. The shows we are attending in 2019 are listed on this page below. Meet us at one of these Motorhome Shows. NEC Show; We commence at the National Exhibition Centre (NEC) in Birmingham in the UK. Venue; National Exhibition Centre (NEC) Birmingham. This year sees us at the Caravan and Motorhome Show. Held at the NEC in Birmingham. 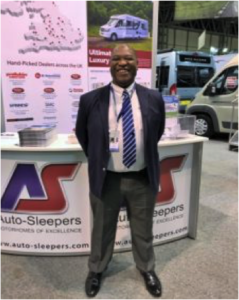 Our sales team are always on the main Auto Sleeper stand. Meet Tim Lemon, Richard Holness and Mike Smith at the NEC. The National Exhibition Centre is an ideal venue to take a day out and wander round the very large displays. Meet Dan Cape at the Peterborough Show. Daniel, as many of you know is one of our senior workshop team and also carries out the vast majority of our new and used vehicle handovers. Dan will be at Peterborough again this year and on hand to help with any of you who may have technical questions or need any further help or advice. This show has a great following and we have been attending for many years. We guess it is that wonderful spring air that wakes us all up for a new show. 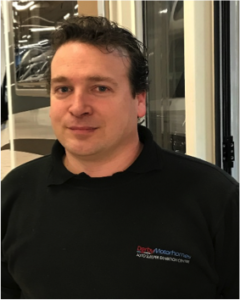 Dan has a wealth of Auto-Sleeper knowledge and is more than happy to discuss any motorhome related issues that customers may have. Like all outdoor shows, this is an event that has entertainment available and stop overs are popular. Venue; Peterborough Showground, East of England Showground, Peterborough PE2 6XE. This is a very large show held just off the A1 at Peterborough on the main Peterborough showground. It is hard to imagine this show if you have never been before. The attendance is always large and the number of motorhome owners attending, vast. Because it is so central this also contributes to the high number of motorhome dealers and manufacturers attending who also have some great displays of both new and used motorhomes. With weekend entertainment available, this is a great place to come along to. Venue; Stoneleigh Park, Kenilworth, Warwickshire, CV8 2LG. Well, at this time of year, hopefully summer is well and truly upon us! In fact, what a venue this show is. So, with large stands, interesting displays and demonstrations of all sorts of useful motorhome accessories, this should be a great weekend away or day out for the family. As this event is being held at the Stoneleigh showground, it’s a perfect, central location, close to the midlands but also not far from the M1 and M40 motorways too. Venue; Lincolnshire Showground, Lincoln, LN2 2NA. Here at the Lincoln show you get that feeling that the motorhome shows are coming to a close but not in bad way, far from it, this is the season finale! Sad really but there are usually lots of end of season bargains to be had. Next year’s new models have usually been announced and some of those old models can be real bargains. In sight of Lincoln Cathedral, a stone’s throw from Lincoln City and its castle and just yards from the runway of RAF Scampton, the home of the famous Red Arrows – what a great location. So, wind-down and enjoy this show. It really is a great venue on the Lincolnshire show ground. We hope we will have one or two of those end of season bargains for you as well. We then go full circle back to the NEC. This is where you usually get to see and order next year’s latest models; the show is massive and anyone who’s anyone is usually there! This event is usually for new vehicles only so please don’t go looking to find a nice used model. 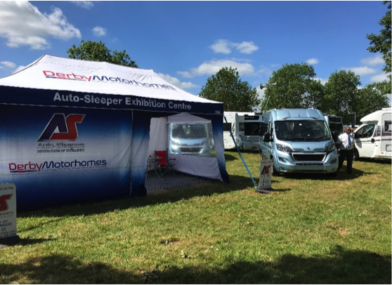 In addition, we take along, to every outdoor show, our Auto-Sleeper roadshow which is usually our easily identifiable tent, a great selection of new and used Auto-Sleepers, our knowledgeable team and a selection of refreshments. Come along to one of these events and meet the team in person. We have Facetime available, if you want to make sure you only deal with Derby motorhomes. Just contact our main number and provide a mobile or email and we will Facetime you and introduce ourselves. Our sales personnel will all be on duty for the whole time that the show is open. We know other dealers have to sell motorhomes but we do promise more than just a deal. We have an extensive team in our after sales department waiting to assist with any problem. We are happy to accept in any part exchange motorhome, campervan, camper, car or motorbike. Part exchange is very important and we want to make sure we do our best for all customers and offer each a fair and good deal. We especially want to look after our existing customers and Auto-Sleeper owners. Bring you motorhome along to a show and let us value it for you! It may be worth more than you think! Let us see what we are able to do “face to face”, come and meet the sales show team. Enjoy a great day out, especially for motorhome people and their families and us too!